As the type designator "T.empf.40" suggests, this Hellschreiber is an "Empfänger", i.e., printer-only. It is for asynchronous operation ("quasi-synchronous"), like the Feld Hell (though at twice the speed), and the Presse-Hell. Hence, the printer spindle has a 2-turn thread. 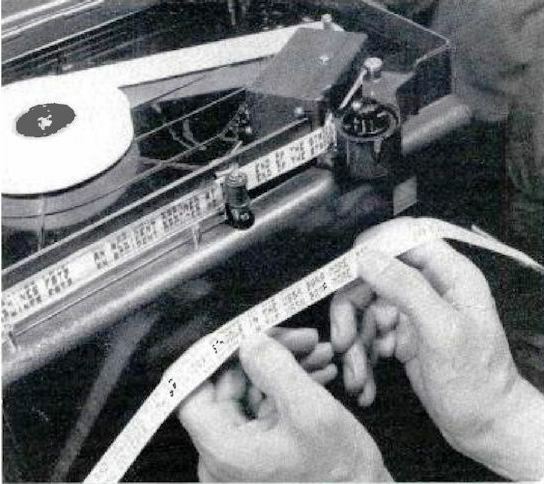 It prints two identical parallel lines of text onto 15 mm wide paper tape. The T.empf.40 is also knows as model "F". 40a: with a built-in tone detector and keying amplifier. It can simply be connected to the loudspeaker output of any radio receiver, whereas the Tempf 14 required an external amplifier/detector unit, or a special Hell-receiver with a built-in detector/driver. The two-stage amplifier of the 40a uses an EF80 and an EL83 vacuum tube (both are pentodes). 40b: without a built-in amplifier. However, it has selectable AC-voltage power (version "a" is 220 volt AC only). This model was used in combination with Siemens-Hell-Geber "S" (T Send 62a) and Siemens-Hell-Sendeanlage "Z" (ref. 1, 2). The South African embassy in The Netherlands is known to have used model "F", as did the monitoring station of Radio Free Europe at Schleißheim near Munich (ca. 1957, ref. 3). Figure 2: The Siemens-Hell-Schreiber "T.empf.40a" - "F"
Size of printed characters: 2.5 x 4.5 mm (WxH). 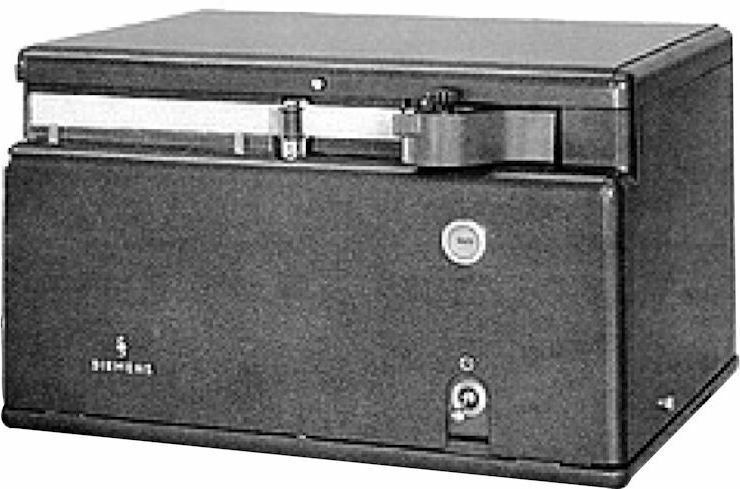 Motor: single-phase induction motor with electronic regulator; the speed control knob is located under the lid of the unit, next to the roll of paper tape. Remote control: tone pulse of appr. 1 sec (motor "on"), 6 sec ("off"); same as in the Presse-Hell printers. Accessory: "Bandaufwickler" (winder for the printed tape), switched on/off via the remote control. Figure 3: Modular design of the "T.empf.40a"
Like the feld-hell and Presse-hell printers, the T.empf.40 has a spindle that prints two identical lines, one above the other. However, whereas the Feld-Hell and Presse-Hell printer modules have a 2-start spindle (two 1-turn threads, offset by 180°), the T.empf.40 has a 1-start 2-turn spindle, see the photos below. This is much easier to manufacture, but requires twice the rpm. Figure 6: Print-out of a "T.empf.40a"
Ref. 2: "Bauarten und Betriebswerte von Telegraphenapparaten für den Funkdienst" table in "Telegrafentechnik", Band 6, Teil 6 of "Der Dienst bei der Deutschen Bundespost - Leitfaden für die Ausbildung", Fritz Schiweck (ed. ), R. v. Decker's Verlag, G. Schenck, 1960, 970 pp.